It is possible that a large number of people complaining very concertedly about Kalin's desire to revive Harlow's methods and Bennett's project could have some positive effect. But it will take more than only a few people calling and writing regularly; it will take many of us. The use of maternal deprivation is a giant moral step backwards for the university. People around the world who know what Harlow did to the baby monkeys are appalled that such cruelty was ever allowed and that it was allowed to continue unquestioned for so long. This remains an embarrassment to more than a few at the university. Isolated monkeys show severe persistent psychopathological behaviors similar to those seen in autistic children. The fact that human children do not develop normally without a nurturing caregiver who is in frequent physical contact with them has been known since the mid 1940s. The importance of this emotional bonding in children has been universally accepted since the early 1950s. 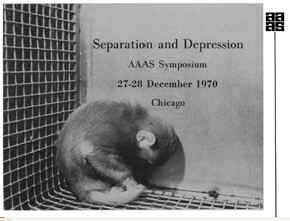 The critical nature and psychological importance of this bonding in rhesus monkeys was demonstrated ad nauseam between about 1958 and 1980 by Harry Harlow and his many students at the University of Wisconsin, Madison. 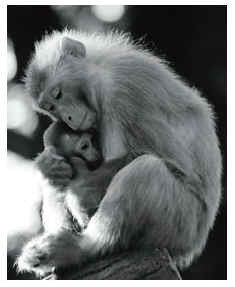 Harlow's and his students' maternal deprivation experiments have been widely criticized for the suffering they caused. Even those who defend Harlow's work sometimes say that such experiments would not be allowed today. The protocol review, begining on page 4 of the ACUC minutes, makes it clear that the unnamed researcher plans on using a snake in part of these severe experiments. As far as we know, the only vivisector at the UW-Madison using a snake in experiments on anxious monkeys is Ned H. Kalin, MD, Hedberg Professor and Chair Department of Psychiatry University of Wisconsin School of Medicine and Public Health. Phone: 608-263-6079. Ned Kalin's experiments on young monkeys have primarily been an investigation into the neurobiology of fear. Over the years he discovered a way to identify particularly fearful young rhesus monkeys. He uses those monkeys in his research. Briefly, he frightens them with a human intruder, a large monkey, or a snake, then damages part of their brain with acid or electrocautery and frightens them again to see whether there is a change in their fearfulness; then he kills them and dissects their brain. See for instance: The role of the central nucleus of the amygdala in mediating fear and anxiety in the primate. Kalin NH, Shelton SE, Davidson RJ. J Neurosci. 2004. From the Closed Session minutes above, it now appears that he "has gone as far as [he] can within [the] "normal" anxiety range." Now he wants to use the methods pioneered by Harry Harlow and his students -- maternal deprivation -- to go farther, to make young monkeys even more fearful. Kalin's experiments on monkeys are not known to have ever benefited human children suffering from anxiety. It's unlikely that they ever will or even could. But why would Kalin choose this moment in time to embrace Harlow's cruel methods of creating emotionally damaged young monkeys? Within 24 hours of birth, scientists will remove baby monkeys from their mothers and then raise them with another infant monkey. 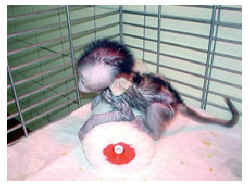 This euphemistically termed “peer-rearing” or “differential-rearing” or “nursery-rearing” is done to create “models” of anxiety, “early life stress,” “early adversity,” and “social impoverishment.” Monkeys who suffer from these “deleterious early rearing experiences” have abnormally high levels of anxiety, reduced movement, and cognitive and motor deficits. Emotional problems associated with this rearing method persist into adulthood. Dr. Bennett's project is titled LONG-TERM COGNITIVE AND NEUROANATOMICAL CONSEQUENCES OF CHILDHOOD STRESS. An abstract is available on the NIH RePORTER website. Unfortunately, members of the public have little to no power individually to affect the way animals are used in scientific experimentation in Wisconsin. Last year after we discovered and exposed the fact that the university was violating Wisconsin's anticruelty laws, the university snapped its fingers and the Wisconsin State Legislature exempted them from those laws. But that doesn't mean that nothing at all can be done. It is possible that a large number of people complaining very concertedly about Kalin's desire to revive Harlow's methods and Bennett's project could have some positive effect. But it will take more than only a few people calling and writing regularly; it will take many of us. The use of maternal deprivation is a giant moral step backwards for the university. People around the world who know what Harlow did to the baby monkeys are appalled that such cruelty was ever allowed and that it was allowed to continue unquestioned for so long. This remains an embarrassment to more than a few at the university. See a bibiliography of Harlow's and his students' publications here. The Chair of the oversight committee ultimately responsible for approving Kalin's and Bennett's methods is Dr. Robert Streiffer. He is the Chair of the College of Letter and Sciences Animal Care and Use Committee. He teaches philosophy and bio"ethics". It isn't outside the realm of possibility that by focussing our attention on him that something might be done to stop Bennett or even send her packing. With enough pressure, maybe Kalin wouldn't be allowed to begin ripping babies from their mothers' arms. For the time being, we are encouraging people to call and to write to Robert Streiffer. Tell him that bringing maternal deprivation back to the UW-Madison is a giant ethical step backwards. Ask him to do everything in his power to stop this and to bring the matter to the attention of the entire campus community. Many people will be shocked to learn that the university has knowingly and willingly chosen to return to its very dark past by reviving and embracing the cruel methods pioneered by Harry Harlow.